Whenever there is a seed saving class, you see seeds divided into easy, moderately hard and hard - or some variation of that. Easy seeds are defined with the least amount of brain power and the least effort - presumably 'hard' is the opposite of that. 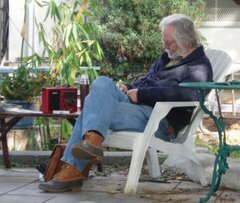 Oftentimes the difference between easy and hard is simply the willingness to observe what's happening in your garden and use that knowledge to your advantage. In small scale seed saving, there is a minimum of tools required (which I feel is a flaw, being an avid tool collector myself) and the techniques are fairly straight forward. Corn is not, of itself that hard to save. But our location, throughout Los Angeles makes it hard to save; someone somewhere has corn flowering the same time yours is! The only way to save it without doubt is to pollinate it by hand. I intend to cover that in the near future, so stay tuned! Corn is wind pollinated - and so it pollinates nothing if no wind blows the pollen (from the boy flowers - the tassels) to the silks (aka the girl flowers) of other corn plants. The descendents of the European invaders are very uptight about keeping plants "pure." That's what makes corn maddening to us. It's hard to get that wind to blow only where you want it! There are ways to control corn pollen and get plants pollinated with only the genes you want. This article is not about that. The peoples who took corn from a sad little grass plant into the culinary powerhouse it s today, had a very different view of plants and plant breeding. Isolating a given set of genetics was the European design, but the breeders of corn took a different approach from ancient times to present day, they allowed the corn to freely cross - and they saved corn from all ears, not just the big ones. The result is that there are hundreds of different corn varieties available for a huge variety of different ways to cook and eat it! empty cobs, already shelled on the left. I was gifted with some ears of Mohawk Red Bread Corn from Rowan White a few years back. I grew it out, got a nice harvest and hung onto the seed, stored it somewhat indifferently until last month when I was asked if I had any corn for a ceremony and I offered up the Mohawk Red Bread. It was making a whole circle in may ways. 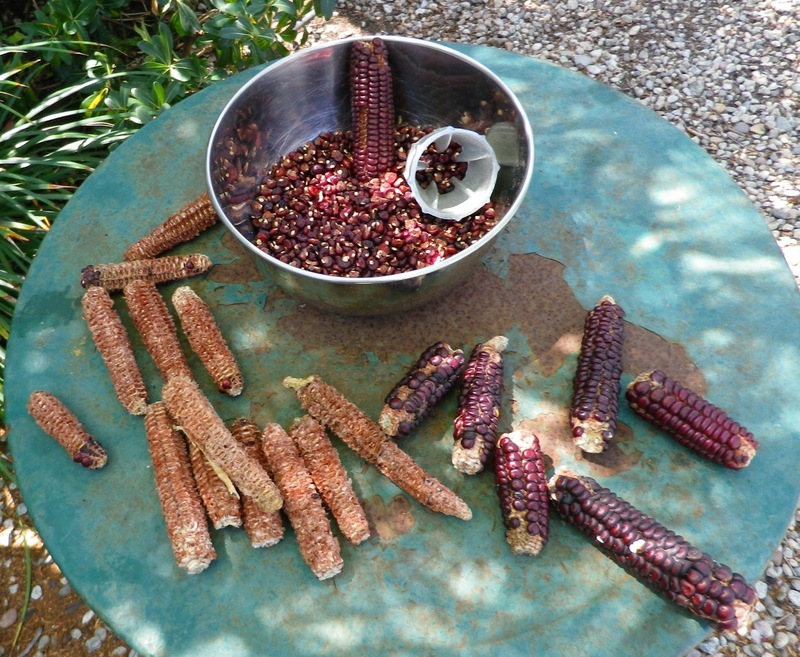 The corn was now going back to Mohawk country to help Eliot Cowan, author of "Plant Spirit Medicine "do a ceremony. The woman who asked for the corn seed had met Eliot through his book, which was stocked in that book store because I asked for them to stock it as it was supplementary reading for my Botany class. Now the lot of us had come together for a ceremony that brought this wonderful corn out of California back to upper New York state. Pulling the corn seeds out of storage was a mystical experience. The seed was no longer fresh, so my instructions were to plant more seeds than he needed just to ensure a good stand of seed. I didn't have time to give these seeds a "germ test" (see my other article, Are Those Seeds Any Good, Mister? for some back ground on this). 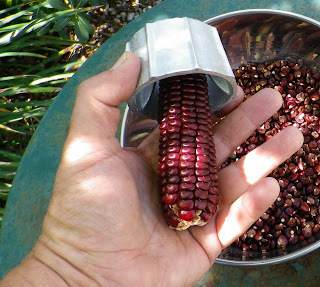 I brought out my corn sheller and tried my best to NOT just take the good looking kernels from good looking cobs. I tried to emulate the corn growers and I tried to shut my internal neediness for a stab at perfection. was the right size for my Red Bread Corn too! These seeds were put into a quart glass canning jar to sit in the freezer for three days. At that time, they'll be reintroduced to the ambient temperature and I will get a germ test done. Here's hoping I didn't give Eliot bad seeds!